As I handed in the final essay for my master’s degree last June, I was overwhelmed thinking of the whirlwind year I had in London with my children Aidan and Aria. From meeting the Queen and voting in the Brexit referendum to starting kindergarten, school and post-graduate life; the kids and I celebrated big moments together. We were sad to leave the UK but a new chapter awaits us back in Malaysia: beginning with an epic train ride home. We were taking the long way overland—crossing 11 international borders and eight time zones—and seeing civilisation change from the cool, cosmopolitan Europe to the bustling Asian metropolis of Hong Kong—with sprawling lands of Mongolia in between! Little did we know of the great adventures (and misadventures) that awaited us on the journey ahead. Click through to see all the photos from our journey. We say goodbye to Mecklenburgh Square and Goodenough College, our London home for the past two years. Our shipping boxes left in the afternoon. We were left with a large four-wheel suitcase, a backpack, an insulated food tote and two small backpacks—one for each child. King’s Cross was a 10-minute walk away and we checked in seamlessly with the QR codes on my phone. We boarded the Eurostar at 1930 and arrived in Brussels Midi station just under two hours later. It was a train and tram ride away to Avenue Grandchamp, where we were guests of a diplomat friend for a few days. Surprised with a nasi lemak breakfast courtesy of our Malaysian host, Lisya, it felt like home. We spent the days in the city, at the Grand Place, one of my favourite European squares. Its ornate 17th century buildings and cobblestone piazza transports you back to a time where merchants brought the marketplace to life. We snacked on Belgian waffles and Godiva chocolate-dipped strawberries while exploring the chocolate and toy museums nearby. We strolled down the glazed arcade of Galeries Royales St-Hubert and marvelled at all the delicate chocolate displays at the windows. Lastly, we treated ourselves at dinnertime, with plump mussels at Chez Leon, and a side of fries to make it a classic. We departed Brussels on the Thalys train and arrived in Amsterdam in the late morning. Next, it’s on to Zaanse Schans, home to the 18th and 19th century windmill and workshops. There we raced along the banks of the Zaan River, which is dotted with massive functioning windmills—their sails harnessing the power of the wind to grind paint and dye, chalk, wood and oil. We also watched people make clogs and cheese and bought some baby Gouda and stroopwafels to take home. It rained on our second day in Amsterdam and we discovered that the luggage lockers at the main train station was full. The bag drop service opposite the station charged a steep fee but we cheered up because we were later joined by friends from other parts of Europe. Out of the rain and into the stylish Café Luxembourg for lunch, we revelled in good company. Then we ventured on to the floating flower market and crossed bike-lined bridges to the canal district, where we soaked in the romantic city charm. The day ended too early as we had to return to the station for our next train to Berlin. The Bahn train pulled into Berlin and we arrived at my brother-in-law Ben’s past midnight. The kids were tired but they were excited to see family. We enjoyed a morning treat of a traditional German breakfast. My sisters-in-law Mara, Dora and Narda spent the day with us at the kids’ favourite playground opposite the Charlottenburg Palace. We tried out a neighbourhood Greek cafe, saw the goats at a nearby community-run backyard-turned-petting zoo and cooled off with home-made gelato at the corner shop. After that, we drew our names in the sand and plucked nuts from the trees. Mara saw us off at the Berlin Hauptbanhof. We boarded the PKP Intercity for an eight-hour ride to Warsaw. The kids made friends with the teenager in our car and watched him play Pokémon Go on his smartphone. The crowd ‘evolved’ as we neared the Polish capital—away from the natty, orderly breed into a working-class feel. For the first time since we left London, the train we were on had less shine and more ‘soul’. When the train stopped, so did the air conditioning. We arrived at our Airbnb studio outside the train station at sunset and I quickly made instant pasta for the kids’ dinner. Our train ride was uneventful, but we had no idea that our ‘boring’ train ride would turn eventful after we arrived. Sometime after noon, we crossed the Polish border and the Belarusian border. The Belarusian police took one look at our documents and said “no visa”. I changed to my Malaysian SIM card to access roaming, so I could go online and call for help. My heart sank when I learned that the Malaysian visa-free option was only available at the international airport and not via the land border. Long story short, we got deported and we were put on a train back to Warsaw, spirits dampened by this setback. We now had to find another way to Russia. Finally, we booked into an airport hotel and onto a flight out to St Petersburg at 6am the next morning. It felt like a cop out to board a plane when the plan was to commute by train, but we made friends with other travellers and their enthrallment at our story made me feel slightly better—they were right, it was an adventure. We got to St Petersburg, and my parents met us at the hotel. They brought Brahim’s meal travel packs and we had nasi biryani! We went for coffee when bad luck struck again. As I was getting an Uber nearby, some people crowded around my son, and as my father got up to check, an affiliated crook lifted his wallet out of his pocket and jumped onto a passing bus. Dad shouted for help, but no one stopped. We spent the rest of the night at the police station. Dad felt better after speaking to his insurance company and we all assured him that we had enough for the remaining trip. We decided to get on the Hop On, Hop Off bus tour so we can hit all the main sights in a day. The kids slept most of the way but I was captivated by the history of the city. We completed the 90-minute bus loop and then got off at the massive Palace Square with the Alexander Column in the centre. We headed to the State Hermitage Museum, which was once a Winter Palace to the Romanovs before being declared a museum after the 1917 Revolution. The kids saw the movie Anastasia before our trip and were excited about the paintings, sculptures and decorative art. On our last day in St Petersburg, we visited the Fabergé museum—home to the second largest collection of Imperial Fabergé eggs. We enjoyed the delicate desserts at the museum cafe before going on to cross the Neva River to explore the Peter and Paul fortress and drink in the tragic ending of the Romanov rule. We walked around Peter the Great’s original citadel and were pleasantly surprised by the Museum of Cosmonautics and Rocket Technology at the grounds. We ended the day with our first overnight train to Moscow. In the second class cabin, we shared four comfortable and plush berths between my parents, the two kids and I. And so began our Trans-Siberian journey. We pulled into the Leningradsky railway station in Moscow at 7am and were surprised to find our family friend Kieran already at the door of the train. He was our host for this leg of the trip, armed with pre-loaded travel cards and an amazing kid-friendly itinerary. He took us to the Red Square and the massive children’s complex (which coincidentally is opposite the KGB headquarters) that housed toy stores, play areas and games that would fulfil any child’s dream. We spent hours in the Kremlin armoury which housed many of Russia’s treasures, like carriages, clothes, imperial dining ware, weapons, armour, and the world’s largest collection of Fabergé eggs and more. Our days were much too short to appreciate everything the city had to offer! We headed to Izmailovo market, also known as the Wooden Kremlin, a tourist market for souvenirs and Armenian barbecue. I got some hand-painted Russian dolls for my aunts and a set of CCCP tools for a friend. We took our time to walk through Izmailovsky Park and treated the kids to a ride on an electric toy jeep, which I reckon was their favourite part of the entire trip—oh the simple joys of childhood! Then, Kieran took us to an amazing Georgian restaurant in the hip part of town for dinner before we detoured to get our luggage and headed to the train station for our second overnight journey. After another comfortable overnighter, we arrived in Kazan. At this point, we are halfway across our journey. After two weeks of travel, the kids and I were tired and decided to take it slow. The days were sunny and we had ice cream on the grounds of the city’s Ministry of Agriculture—with an imposing wrought-iron tree that stood out as a magnificent piece of architecture. We explored the (unfinished) Temple of Multiple Faiths, and then the kitschy Museum of Soviet Lifestyle in the centre of town, a tiny two-storey shoplot filled floor to ceiling with cultural knick-knacks—housing an odd collection of household items used between the 1910s-1970s. We checked out of our apartment and booked our luggage into the baggage drop at the train station. The kids napped on the grass slopes of the Kremlin. We picked up some items, did our laundry and repacked for the long train rides to come. We got a shock at a local restaurant which charged us 250 Russian roubles (about RM18) to use some Tabasco sauce to add spice to our meals. Must remember to bring our jar of sambal belacan out with us next time. We got an Uber to the train station before boarding our night train to Yekaterinburg. We found out that the times stated on our train tickets were printed in Moscow time. This meant that the arrival time at the subsequent Russian cities will be later than our original schedule. We arrived in Yekaterinburg in the afternoon, instead of the morning. I explored while the kids rested; the Church on the Blood fascinated me. A house once stood on this site, where the ill-fated Romanov family were placed under house arrest before being marched into the basement and violently executed by the Communist Bolsheviks. Imperial Russia ended here, and a new Soviet rule dawned. After we left Yekaterinburg, the city on the east of the Ural Mountains, we were finally in Siberia! After that, it was trains for days. The trains we were on were slow trains. We kept busy with books and games, making shapes out of the clouds and chasing double rainbows. When it got dark, we watched movies before bed on my laptop. Finally we arrived in Irkutsk, on the lip of Lake Baikal, the world’s deepest freshwater lake and the gateway to Mongolia. We had officially crossed Europe to Asia but have still a way to go! Lake Baikal is beautiful. Our tour guide from Baikal Secretstook us to the lakeside village of Listvyanka to the Baikal museum, which tells the story of the lake’s prehistoric evolution into the massive body of water it is today. We visited the local market for smoked fish and went up a ski lift for an incredible sighting of the lake from 728 m above ground. The locals are sweet, a change from the gruff Russians we met along the way. My only regret was not having time in this curious little tourist town. Siberia captured my heart, and I hope to return someday. We spent two days on the train. We quickly made friends with a family from Argentina, who like us, have been on the road for the last few weeks. We all got on well, alternating the hours between our berths and theirs, sharing toys and games—all different, but also the same. We arrived at Naushki and welcomed the break by disembarking to stretch our legs. To our shock, the engine caboose pulled the train cars away from the platform, with our luggage and things inside, in an apparent disassembling exercise prior to crossing the border. We waited in the scorching heat. Hours later, one engine heaved onto the platform, with one single car attached—ours. We boarded and it pulled us half an hour just across the border. We arrived at the Mongolian border and the customs and immigration police boarded the train to collect our documents, leaving us in the sweltering heat while they conducted the relevant checks. By the time we reached the Mongolian border city of Sukhataar, the sun was already setting. We spent a few hours at the local playground, getting snacks and pickled fruit at the sundry shop while our car got unattached from the Russian caboose to be reattached to the end of the long-line of a Mongolian train headed for Ulaan Baatar. Mongolia is incredible! My sister Aida waited for us as we pulled into Ulaan Baatar at 6am. We went to visit museums and temples that told the story of how the Qing dynasty brought religious and cultural revolution which influenced contemporary Mongolian life. Then we travelled out to the Genghis Khan monument, the world’s largest mounted horseback statue. We climbed to the top of the horse’s head and visited the museum below. Fourteen life-sized statues of Mongolian warriors on horseback stood on the grounds, facing where the sun rose beyond the mountains—there are 9,986 more in the works—to showcase to the world the military power of 13th-century Mongolia. We then hit the road, with all of Mongolia’s raw beauty before us. We spent half the time on highways and another half on dirt roads to reach our gers—little yurts housing three to four people each, set in the heart of a steppe valley of endless grassland, surrounded by majestic mountains. Upon nightfall, the kids and I spread our blankets on the grass outside, under the billions of stars. Here, in the absence of anthropogenic light synonymous with cities and large populations, we witnessed the greatness of the cosmos in all its glory. A brilliant shooting star shot across the milky way and I made a quiet wish for my family and I. It was raining when we visited the Khustain Nuruu National Park, home to the endangered Przewalski wild horses. Just as we were about to give up, we spotted them, sheltered in a rocky valley. The ranger told us that this was the first sighting in three days and we were fortunate to see them. 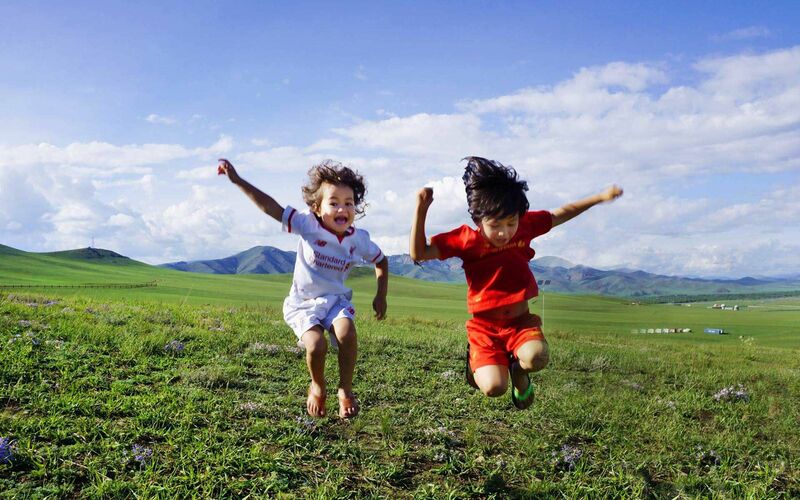 We travelled to the Semi-Gobi desert and stayed with a nomadic host family. They earn enough to save a little, but because they have no address, they don’t take loans and therefore don’t live in debt. The modern world categorises them as some of the poorest in the world, because they live on less than $5 a day, the same way they have done 1,000 years ago, while the rest of the world progresses and evolves. Yet, the simple life is not easy. Climate change meant that their wheat crops are failing—the rain comes late and the summer is too hot. That being said, we are privileged to experience the nomadic life, even for a few days, and hope that the batik cloth we gifted them will remind them of the people they have touched. I will be honest, our stay wasn’t easy without access to toilets, we are so used to this creature comfort! Nonetheless, the gers were warm, the beds comfortable enough, our hosts hospitable and the view unrivalled. We rode our host’s camels into the desert and Aria fell asleep at the end. Looking at her, I wondered what other odd places my children will nap in, in the future. Mongolia is home to more than three million horses, an equine population that outnumbers its humans. These horses are semi-wild so it was dangerous for the kids to ride on their own. Riding with the horsemen was a great thrill! Aidan loved it so much; he would dissolve into giggles when we break into a gallop, saying “chuh” to make the horse go faster. When we were leaving the family’s ger, the old man Aidan rode with came to shake his hand—he was glad to have made a child so happy. In the afternoon, we took a long drive back to Ulaan Baatar to stay for the night. We initially wanted to continue the journey by train via Beijing but the visas were too expensive and inconvenient to apply for. We arrived in Hong Kong in the late morning. We checked into our bayside hotel and had a lovely seafood dinner overlooking Victoria Harbour and I shopped in preparation for my impending work once we returned to Kuala Lumpur. Unfortunately, by the time we got to our hotel, we received news that we were in the path of Typhoon Hato, and that the eye of the cyclone was gathering speed right at us. I had to break the news to the children that we will not be going to Disneyland tomorrow. Typhoon Hato rained on our parade and we were hotel-bound for the day. No public transport out of the Bay and prices of private cars have tripled from the risk of being on the road. A Signal 10 hurricane warning has been issued, the strongest in its class, for the first time in two decades. The storm brought the city to its knees. When the storm died down at 5pm, we ventured out into the washed out city, in a Tesla-driven Uber with the plate name Momocha, to a closed mall and streets strewn with pieces of everything. We took a a chance on a delayed flight so we can proceed with our initial Disneyland plan and I spent the night making logistical arrangements to make it happen. We soon found ourselves in the happiest place on earth, Disneyland! The kids were excited and were dressed up as Captain America and Queen Elsa (“not Princess, please,” Aria said). Yes, I lugged them halfway across the world. We had a flight to catch at 6pm and have scheduled to leave by 4pm—so we went on a mad rush to see and do as much as we can. I had the app downloaded on my phone and breezed through rides before rushing to the airport. Our flight was delayed only just slightly, despite the full-day closure the day before, but by the time we landed in Kuala Lumpur at 11pm that night, Aria’s Elsa crown was askew as she slept on the shoulder of the plane seat, and we were flat out tired, but full of fun stories and adventures to share for many years to come.